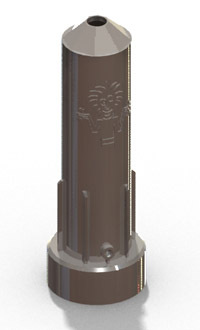 Onticco worked with Eepybird to design this simple, cost effective injection molded nozzle for creating the famed “Diet Coke and Mentos Fountain”. Simply fill it up with a stack of mentos, insert paper clip to hold the Mentos, screw it onto a bottle of Coke, pull the trigger and watch the magic. Chemical processes cause the CO2 in the soda to be separated from the liquid essentially causing the soda to explode and shoot out through the hole in the top of the nozzle.